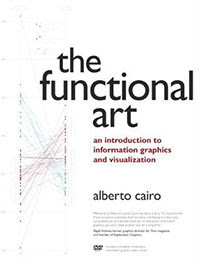 Information graphics and visualization is a field in constant change and evolution: many of its components, such as statistical charts, were defined not so long ago. 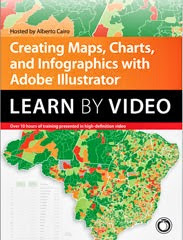 That's why I get so excited whenever I see charts, maps, and diagrams that are clear, revealing, and new, in some sense. I'll give you two recent examples. The first one, that you can see above, was published this morning by The New York Times. It's titled 'Party Purity', and it shows the percentage of the time senators voted with their parties between 1989 and today. 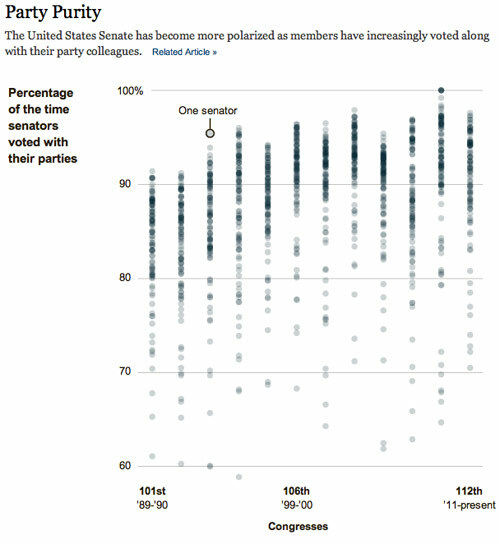 Every dot represents a senator, and the pattern is striking: the Senate is far more polarized than it used to be. The print version of the graphic, which I have in front of me while I write these lines, is just 1-column wide. I believe this chart shows what can be achieved in a limited space and with a very simple (albeit not simplistic) graphic form. The graphic runs with a story about a moderate Republican, Olympia J. Snowe, who has decided to retire amid constant pressure from the far right. 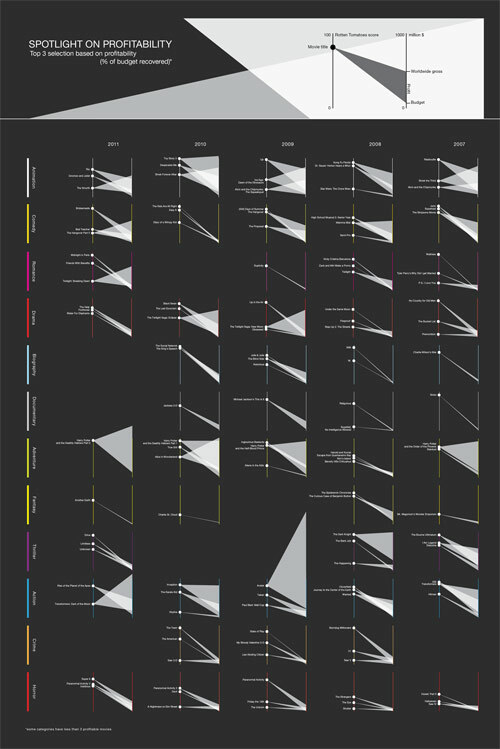 The other infographic for today is a finalist for the Information is Beautiful awards, it seems. 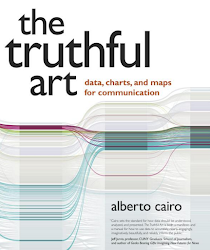 It was created by Krisztina Szücs, a hungarian designer, and it is a delight to read. It compares the average score a number of movies got in the RottenTomatoes website with their budget and how much money they made in the box office. It is not perfect —I would like to see a few tick marks on those vertical scales, for instance—, but it led me to an enjoyable eureka! moment, and I do love having eureka! moments every now and then. 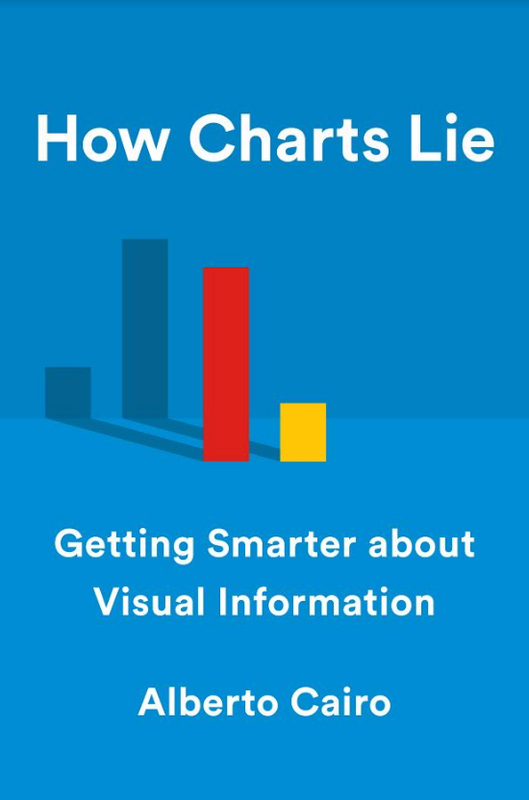 It doesn't happen very often in these times of dubious infographics and meaningless infoposters. Sadly, the kind of (mostly) bad work you can see in those links is what sets the standards for graphic communication in the minds of managing editors in the media nowadays. It's a trend we need to fight back. See Krisztina Szücs graphic here.